Take a look at this! See that big red December? See that? How can you miss it? I did that, so that I would never forget how precious life is. As if I'd ever forget... Well? Let me tell you. It's been long enough, that sometimes I begin to forget! I begin to take life for granted, again! I don't ever want to do that! What happened to me is a real blessing in the way that it taught me how precious life is. Wow. I'm amazed. Can you believe it's November? Weren't we just sitting on the deck in the sunshine, sipping iced drinks, and waving the heat away? What did the doctor mean, way back then, when he told me that if I want to travel, "now is the time?" I took that so seriously! That rung in my mind for so long, but now? I'm a little glad I didn't! I actually thought about just charging up my credit card and having a hey day! Can you imagine if I had? I'd be so broke! Not that I'm not broke already, but I mean broke-broke! But, after all, the good doctor was right. Any time is a good time to travel... as long as you can afford it! Did you see that I put my favorite little icons up? The ones with the snow? I just adore those! Every Christmas, I have to decide what color this Holiday will be. Will it be a Christmas full of colorful lights? Crayon colored happy Christmas lights, or a white lit elegant Holiday? Some Christmases are all blue.. or all red with little red bows! This Christmas, I've already called it. It's going to be mostly white with a few red highlights. It's going to be gorgeous! Let it commence! I know! I'm early, but I don't care! I'm just going to pretend that the good doctor said, "Jennie, if you want Christmas, you better do it, now!" After all, we all need to learn to live that way. We never know when it will be too late! I just posted Stan's column. It's great, as always! Read it here! Why on earth, when I get to sleep in, did I wake at 5:00? Oh, berother! That means actually 4:00? Oh, my! I'm afraid I've pretty much lost interest in trying to catch salmon, this year. The run is just so poor, and you know, after reading the David Duncan thing on the 1859 magazine website, it totally turned me around. I guess it doesn't stop me from dinkin' around in the river, but I'm not so much for really fishing for keepers. It's almost like I need something to do for fun, so a drift trip fishing is fun, but I'm not serious about catching. Sure. I have a rod. I have eggs. I have a lure, or whatever... but it's more about watching and looking and the water and being out and thanking God for all that surrounds me. For my purposes, as an angler not so dialed in, it works well! Because after the trip, I'm not upset if we didn't nail them! I'm just thankful for my time on the water! Hey! There's a new contest coming out on ifish, and it's really creepy but really cool! Joel, from NW Wild Country radio is putting it on. It's such a neat idea! He has put together all kinds of fish eyes and you are asked to identify them, only from looking at their eyes! Way cool! I'm waiting for him to put it up, and I'll let ya know when it hits the page! Bill is hunting today whenever the tide is right. He's hunting here, rather than in North Plains. Not sure what I'll do, but probably play on the river, somewhere. Oh! You saw that the Kwikfish coloring contest is open? Did you see my love kwik? :) I love it! You guys, I'm playing doctor now, and here's my prescript: If you are going to call your friends and tell them you love them, you'd better do it now! If you are going to fish, fish like there is no tomorrow! You'd better do it NOW! In fact, today is a day when I have to reprint this list. Enjoy! I sure do! Remember.. This is the day that the Lord Hath Made! Let us rejoice and be glad in it! 3. Follow the three R's: respect for self, respect for others and responsibility for all your actions. 11. Live a good and honorable life - then when you get older and think back, you'll be able to enjoy it a second time. 13. In disagreements with loved ones, deal only with the current situation - don't bring up the past. 14. Share your knowledged, it's a way to achieve immortality. 16. Once a year, go someplace your've never been before. 17. Remember that the best relationship is one in which your love for eachother exceeds your need for eachother. I have the blues. I've been trying all morning to figure out how to get rid of them, shake them, recover, but I realized I really shouldn't try to do that. I guess it's good to have the blues once and a while. Then, you know what it feels like to feel good. I drove through Tillamook yesterday and it was deserted! The wonder of how it used to be, driving through Tillamook this time of year hit me. What a great word! Do you realize the word "wonderful" means just that? Filled with wonder! I think so many don't really think about words, and just think "wonderful" means good, awesome, fantastic. But, "filled with wonder!" That's so much better! David James Duncan says that's his second favorite word, next to love. Wonder! Wonder filled! What a great way to be! So, when I'm "good" and someone asks me how I am, I am going to say "Wonder filled!" I have this vision imprinted in my mind of how excited I was, one day, to honk at Jim Erickson, as he drove passed me through town with his boat. He was in a line of rigs, after a day of fishing. You know how a wind comes up at just the right time, and everyone lines up to go home? That must have happened, or the tide turned, or whatever. But, everyone was going home, and I could pick out nearly every one of them, by name. But to see Jim was fun! My special friend, Jim. "Hi Jim!" I honked and waved and tried to catch up with him. I wanted him to pull over and give me a report. How wonder full to be filled with the festive sights of Tillamook in the Fall. Fishing rigs everywhere! Crowding the lots at Tillamook Shilo! On the road, the boats and trucks hauling here and there and everywhere! Many of the cars with vacationing rental plates are gone, and local vehicles replace them, crowding the hiways and bi ways and ramps and rivers! It's a fishing town! It was! It was a fishing town? What happened? Am I just out of the loop, or did things change? Have the salmon gone, or is it just a bad year? Or are the fish later and later each year? I keep thinking about a tweet I read the other day, from a die hard Tillamook (and everywhere) fishermen I know. "Covered the sled today, and cleaned the drift boat. I'm ready for Springers." Bill and I can't get it going. He asked yesterday if I wanted to fish. Later in that day, I had the fishing bug, so I said "Yes, let's!" But, somehow we didn't. We woke up late, and even though we hooked up the boat, both of us sit here, and it's nearly noon, now. Guess we aren't going. Anyhow, I guess I just have the blues. I guess I just have to get used to it. I keep wondering if catching a salmon might cure the blues, but I can't help but worry that it might contribute to them. If I catch and keep a salmon, would I feel joy or guilt? Even if I released it, would I harm it and affect its ability to spawn? I just got back from the river, fishing with bobber and egg. Part of me wanted it to go down, but part of me just wanted an excuse to be out on the river. To enjoy it's placid solitude. The water was windless, glasslike, even though there was a slight breeze in the air. I think, perhaps, that reading David James Duncan's latest essay that I posted the other day... I think it's affected my mood. Oh! If it wasn't displaying for you the other day, it is now. I keep wonder-ing, how can I best affect our fishery, while running ifish and while catering to the love of all these people's desire to catch fish? I stand in wonder. No. I stand in confusion. We all love our fish so much! I made up a new word, today. It's loveful. Just like wonderful, but with love. Let's be filled with it! How come we don't have that word? We have hateful... where did loveful go? "Thank God that Jennie has the blues!" The kids might as well be shouting that! The kids at Emanuel Hospital, that is. Here's what. The bluer I feel, the harder I work and the more of me I put into the Kids for Christmas event. I know... I know, it's not to the caliber of the TV Toy Drives or any of that, but we do pretty good for ifish and it makes me less and less blue, all the time! That's what! It makes me cry happy tears! Of course I'm sad that they have to be in the hospital, but I'm thankful that we can do a little bit to help. Kevin Newell just wrote in that he's auctioning off an ocean salmon & crabbing trip for FOUR people! Can you believe that? Last year, that alone brought in $800.00 for the kids! Whoo hooo! Kevin is a Saint! I've put my heart and soul into this event, this year! I just spoke to Sally at Emanuel, and she said that this year is especially difficult, first, due to the economy and then on top of it, due to the H1N1 virus. They won't even get to have a party, this year, but all gifts will be delivered to the children, bedside. So, let's gang together here and let's help the kids who have to stay at Emanuel Hospital have a very, Merry Christmas! Please come see us at Pietro's on Dec. 1st! I'm trying everything I can for this event. I have donated all proceeds from Cabela's sales to the kids event. I have asked sponsors for donations to auction off, and I have gotten some volunteers to work the party. We still need more, though! If you want to volunteer, please use the contact form, below! Off to the doctor, today. I hope my eyes are alright! Look out! 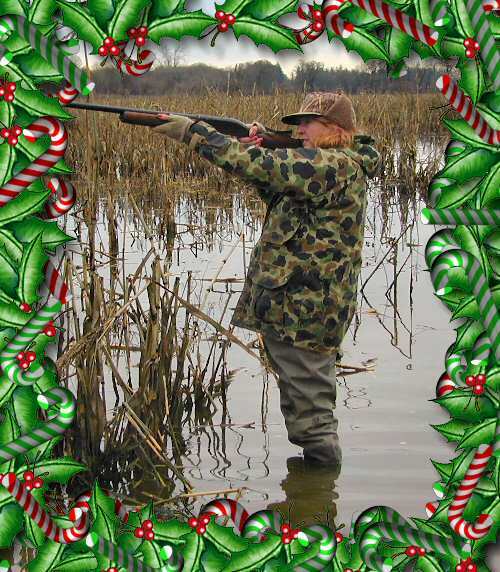 It's a blind duck hunter! When I go out of town, I simply MUST stop at Costco to buy duck jerky. When I come home with duck jerky, the dogs forgive me for my time away. In fact, they forgive all sins. It's called the unconditional love for treats. They wag their tails and think "What a mighty hunter is she! She has been out in the field hunting and look what she has brought us!" Of course, I must be on the hunt! Why else would I leave the home nest? Truth is, (but don't tell) I went to the doctor and I went hunting at Nordstrom Rack! They had a "big shoe" event sale and I had to go! Both Andrew and I have big feet and it isn't cheap to house them! Andrew wears a 16-17! When I was little, my Mom and I would spend entire days trying to fit me at Nordstroms and at a little store called .. Nados? Was that it? At Lloyd Center? Finally, my Mom would throw up her hands and say, "Just put her in a shoe box. Wrap it up with duct tape and call it good!" I mean, it was so frustrating to have an 11 AAAA foot at 12 years old. The only shoes that would fit, were old lady styles. Yuck! And I was at that age where I was so embarrassed of my long, snaky foot! Now, I kind of admire them. They are long and slim and look like princess feet! I so wanted to stop and get my toes painted and get a pedicure, somewhere. Instead, I hunted ducks at Costco. And, I found no shoes for either Andrew or I, at The Rack. Oh, well! Fact is, Costco was out of duck jerky, too! I failed the hunt on all counts! Sounds like fishing, lately! I came dragging in the house with chicken jerky. The dogs accepted my gift, but not as excitedly as if I had a bag of duck. But, they forgave me. Rev and Bill are out hunting this morning to cover for me. Maybe they'll get duck! I have great news from the eye doc! Get this! I see better today then I've ever seen before! Well, not totally, but on the Snellen Eye Chart! The doctor was thrilled! I mean, two years ago, I went 8 months, totally blind. I thought for sure that I was done seeing. I accepted it. I learned to walk the river without sight. I knew every branch, every soggy grassy knoll that might give, should I accidentally get too close to the water. I even practiced bobber fishing, blind! Now, that was a challenge! I'd toss out the bobber and then I remembered, "Oh! This isn't going to work!" Makes me laugh, now. Anyhow, since then, I've had a retinal detachment repair, The haptic in my sewn in lens gave way and it was repaired, and I've had a corneal transplant! All of that, and now that eye sees 20/40 on the chart! I have to study it for a while. The images are all messed up and distorted, but after a while, I can make it out and I see up to 20/40! My right eye is 20/20! It's not distorted so much, but very dim. But, my brain puts the two together, and I can see! I can see! Isn't that awesome? It's flat vision. I have no 3d, but because I once had 3D vision, my brain kind of knows what it should look like, and puts it all together. My right eye fixes the distortion in my left and it all works together just fine! I can drive! I can compute! I can bobber fish! I can see! I guess I have no pupil in my left eye, so there is light streaming in from all angles and that's what distorts my left eye. My right eye lends light in the proper way to my left. They work together. I'm down with that! So, I left the eye doctor's office singing! I'm still singing, today. Think I'll go look at the river! If anyone wants to read why I'm so thrilled with this, read about all my eye surgeries! My eyes look awful to someone else. I have sewed up blebs and they look like a patchwork quilt. But, you know what? Who cares? They work! Bingo! Hit the nail on the head! The reason I have the blues? I'm low on vitamin D! I need sunshine, you guys! Last year, the good doc recommended I lay in a tanning bed to get some sunshine and it worked! I haven't done that for ages! So, today, I'm going back in the sunshine! Heck with that it isn't good for me, long term. I believe that as long as you don't burn, it's OK. Plus, I look and feel better! Yay! Hey! There are some awesome auctions on ifish that I want you to be aware of. These all go for the Kids for Christmas event. You can be involved, here! If you have something you'd like to auction, let me know! EVERYTHING you buy from Cabela's, when you use the link above, or right here, benefits the Kids for Christmas, too. So far, we have over $100.00 in the Cabela's account! Right now, Cabela's has a spend $150.00 and get $30 off deal. Pretty good! Yesterday I went out and played with a Mag Lip. I'm talking to Buzz about having ifish color a custom color and have it made for the show, so get ready! I have the blank, here if you want to start early with your design! The custom Kwikfish contest ends on the 15th, so get that one in! There are only two pages of entries! Where are you guys? Get busy! Print out the blanks and sit down at the dinner table with your family. Get out the crayons and go for it! Then scan them and enter them on ifish! You could win! You know, I think that when the river is high and full of leaves like it is, and the fish could be anywhere, since they are traveling... that a spinner or a lure like a kwikfish is a good bet. You can cover so much more ground. It's probably good to use scent, to give you an extra boost. Maybe they'll come looking for your lure, if it smells interesting! I've even gone so far as to use a pink worm trailing off one of the hooks to give it more visual interest. I'm so smart... aren't I? Then, where are my fish? Ha! I'm listening to a great new release with Herbie Hancock on it. I love it! LOVE IT! I'll never forget seeing Chic Corea and Herbie on two grand pianos, as a kid. My Mom took me, knowing full well what a jazz freak I was becoming. I sat, the entire time, in an absolute thrilled daze... One day, one day I would play like that! Well... not quite, but I did enjoy it so much! I'm still playing, too... and I can dream that I play just like they do! Man, I have a lot going on. Pray for my sanity! I'm tired and I'm emotional. Therefore, I printed this out and had Bill read it and asked if I should post this. He said it was OK. I pray every day that the right owner will come along for ifish. This can't be good for my health, worrying so much, and having so much on my plate. It's not the work, so much. There isn't a bunch of work, as in hourly "work". It's not measurable in units. It's mostly worry for me. It's dealing with the business aspect that is difficult and worrying, because I am only self trained through ifish. I react, instead of plan and it all goes so fast, I can't keep up! I don't know if it's because of my disability, or because I'm not trained, but I'm feeling overwhelmed by it all. Ifish could be a business for someone that could feed a family, or more. I just don't know how to do it myself, and besides, that isn't why I started ifish! I didn't mean to start a business. A business plan? Ha! As if I had time to plan! I just keep peddling as fast as I can, trying to catch up! I never planned on ifish being a business, anyhow. It never was about money, and as long as I own it, it never will be about money. The only reason money is involved at all, is because ifish costs money and some of the things ifishers want cost money to provide for them. I started ifish simply because I loved fishing and the internet fascinated me. I had to find out how it worked. Oh, boy! I found out! I love fishing, but sometimes I forget that because I don't get to fish very often! So rarely, in fact, that Bill and I both have lost that "dialed in" feeling. I so miss that! I was talking to a Tillamook friend in Fred Meyers the other day who had experienced "terrific" fishing in Tillamook, this year. Yes. I was surprised! But, as I listened, my mind started to wander and wonder what it was like to have those days where you'd get up each morning and put everything off to fish! That's what he had! Where was I? I used to be in that group of people that knew the secrets! Now, I'm so far from them, I didn't even know they existed this year! Remember being into a series of hot bites and nothing in the world mattered but that!? Whoo hoo! Can you relate?! I sure can! I used to have those times! Is it that fishing has gotten worse, or is it that I'm just too occupied to find that bite? Don't get me wrong. I never want to be without ifish! I love it dearly. It will always be my baby.It is like how I feel about my kids in a way. My boys will marry someday, and have families of their own, but they'll always be my babies! They will have another family to introduce me to, and I'll get to enjoy their children and their family! I look forward to that, so much! But, I do worry that ifish may impact my health and reduce my chances of being around that long. Especially with my challenged health problems, as they are. With my kids, I'll get to come to their families home for Christmas and sit and watch and be so proud! I'll get to bring a dish for dinner, and to bring presents and be a great part of the family, and that's what I want to happen with ifish. I want to see where someone else would take her, yet be able to be the proud Mom that gave birth to ifish. I want to see ifish soar! I want to help, but be able to send the grand kids home, at the end of the day! I used to fish more. I used to paint! I used to play the piano and garden and play with the dogs more. And I most certainly did not run when the phone rang! No kidding! Sometimes I do! And I don't mean I run towards it, either! I want to be able to rest when I need to, without guilt. I don't like having to stare through the visual disturbances of a migraine because I have no choice. I don't want to have to sit in pain, and type out emails when I know I should be laying down. I don't want to have to feel like I can't go to ER, even though my ulcers are bleeding because there is an ifish emergency. That's terrible! But, it happened, just the other night. I used to walk out to the river and sit and watch the water go by and feel total peace, but now my mind races and is always active with worry or thought or plans or "to do" lists. I feel like my mind is on constant overload with planning. I'll be tying a knot and think, "Oh! I should have a contest for this or that and give away this, and I should call these people and see if I can get a prize for the ifishers, and oh! I'm now trying to untangle my Kwikfish and I think I have to make sure that the Christmas party decorations are clean, and that I have enough decals to go around! Pretty soon I look to Bill and say, "I have to go home." Sheesh! Slow down, woman! Bill and I used to lay out in the yard and stare at the sky and put little bread crumbs on our bodies and let the chickens crawl all over us, eating. We giggled as the clouds floated by. I want to do that again! I need to do that! That "roll in the warm grass" feeling requires absolute peace, and I can't figure out how to have absolute peace AND ifish. I so wish I could! Thus, I pray. I pray for peace. I even get down on my knees and pray for peace. Is it possible to have ifish and peace? I pray for the right owner for ifish like I pray for the right partner for my children. Once, a dear friend told me that when her son went to college, he said "Now I get to see who you are, Mom! I get to see what you are and what you choose to do with your life. It's your turn!" I have to laugh. Not only is it not my turn yet with my kids, (they have moved home, yet again!) but, all I am right now is ifish! My kids come into my office in the morning and instead of greeting me with "Good Morning, Mom!" like I know they want to, they stand back, timidly as if to say, "May I approach?" They say, "Mom? Are you busy?" with the most timid voice! They know that Mom may growl! I don't wanna be that Mom! I wonder if I had time, who I'd be? I have certainly woven a web, here, and it's world wide! In His Time... God is going to let me watch the family of ifish grow. He will make me a part of it, but He's not done with me here, yet. In fact, if I have a say in it, I will never be done with it. Like I said, I always want a big part of the pie, here. I love ifish with a passion. I just miss the community of it, so much! There are days... weeks, sometimes that I don't even get to read the board! Some days, though, I sit down and go there, first. I read, and I just start to get into the swing and the feel of it, again, and then I'm swept off to the other side and have to leave. Sigh. Someday.. someday I'm going to get to play ifish, again! Be a part of the membership! The membership that does things like this! Have you read that? Talk about chills. That's ifish, for ya! That's what I want to be a part of! I walked out on the river, today, and I took a couple videos. You can't see the fish well. At least, I couldn't when I watched the videos, but oh, how I love salmon! Here are the videos, one, and two. It felt so good to be out there, appreciating the things that drove me to start ifish. I love salmon so dearly! Somehow, I got to the point where now I can't express my feelings about how I feel about salmon, because I run ifish and I want everyone to have a voice, here. If I were to post my views, it worries me that it would set the tone for others. That they might feel stifled. There is already enough of that from the strongest posters, so I've decided I should be without opinion, except here, on my column, and even here, I best not go too far. Not that I have strong opinions, really, anyhow... But, sometimes I do. I'm rambling now... I'm so tired. I just wanna go rest. I had a great day, walking on the river, viewing salmon and enjoying the river. I just miss being able to do that at will. I don't feel good enough to always do it, and so when I do feel good, when I do have enough energy, I just wish that every dang time I felt good enough, to go, that I could just go! You know? Same is true of fishing. Same is true, I suppose of a lot of things I want to do! But I can't, because of my responsibility to so many people on ifish. In His Time. I know, Father... I know! I try to have faith! In His Time, He is going to find the perfect owner for ifish who will help me. I bet He knows who it is, already! Maybe I need to have more faith. Maybe I need to be more obedient. Maybe I need to serve more. Maybe I need to think of others, instead of myself, more. So many things I can improve upon! I guess it's kind of like watching the tip of your rod for a bite. I just wish I were more dialed in! I wish I were a better fisher! A better Christian!! Maybe if I slowed down and was able to listen more! The great big wonderful family, that is ifish.net. The storms, they are a brewin! LATER TONIGHT AND MONDAY MORNING. I love a good storm, but my Maple leaves are all blowing away! They were so beautiful and bright red! This year, I have to be very frugal for Christmas, so I'm trying to make all my presents. Today, I'm headed for a crafts store! I hope I get home in time to actually "craft" something! That's the fun part! We really need a craft store in Tillamook! Maybe that would be bad for the bars and taverns, but good for the county, overall! There just is so little to do, around here! I think it would be fun to be in a crafts group! I also want to get together a group of women and have a cookie swap and tea, before Christmas, with some of my lady friends, here. Fun! Speaking of local lady friends... I saw Marie yesterday of Tillamook Bait for the first time in so so long! Every time I stop by, she isn't there, or it happens to be Tuesday and I forget they are closed! It was so good to see her! I picked up a bottle of her famous shrimp scent and a salmon jig from First Bite Jigs. I have tons and tons of steelhead jigs, but none with one of those big old strong salmon hooks! Let's see... I just spent 10 dollars on me for Christmas! I don't want to save them and put them in my stocking, though! I want to use it now, before the water rises, again! It's about perfect, right now! I think I'll go fish.... nah! I have to go to the crafts store! See ya later! No storm, yet! But, they have upgraded the warning. Click here for the latest. Note the red printed warnings at the top of the forecast. Pete (the admin) lost his beloved dog Stoney a couple days ago. His dog was 13 1/2 years old and has been struggling for a while, now. Stoney died peacefully. It hurt me to have Pete lose his dog. It's the beginning of the end of an era, because some of the mods are losing their long time friends all at once. Just as we got these dogs all at once, it is their time to go, soon. STGRule's was the first to go, and Pete's was next. The day Pete lost his dog, I conversed with Fred Archer about his long lost love. Fred invented those Archer bars and is a sponsor of the Salty Dogs board. Anyhow, Fred sent me some material and he allowed me to post it. It has really hit my heart. You know, years ago, I wrote a poem about holding your hand to your heart, and feeling the "thump, thump" of your heartbeat. That, I wrote, was the wagging of the tail of your lost friends. I still believe that... but this poem by Fred really goes deeper than that. This made me cry, but a good cry! To think that my last beloved dog, Hershey, picked out and sent Kilchis to me, makes so much sense! I had to hug my Kilch for a long, long time! Thanks, Fred! -and for all of you who want to read Fred's poem, please click here! Have a wonderful stormy day! Good afternoon my darling Christmas elves! I can't tell you because I'm making gifts for some people who may read this. (Is it you?) I'm broke this year along with everyone else, so even the kids are getting home made things! I told them. I told them that this Christmas will be different. We are going to adopt a family that is not as lucky as we are. I mean, one that doesn't have the luxury of running water and electricity like we do. We are lucky! We can help someone else! And, my priority is keeping a roof over our heads and making sure that we have the basics. Anyhow, my hands are just whacky colored with an array of different inks and I'm just a mess, but I'm having an absolute blast! It's so therapeutic! I even turned off my phone, yesterday! I drove to Lincoln City to get supplies, and I went wild! It was so fun! I love craft crap! Is that cussing? I got colored crud, and glitter crud and ribbon crud and holly crud and glitter glue and crud to put crud on! Let's say it together! Everyone is getting Crud for Christmas! Did I tell you how much fun I'm having? Why is it, though, that I keep getting interrupted? By UPS, and the mailman and the doctor who wants to change appointments, and the VISA people wanting me to take a new card? And Bill, who wants to convince me it's time to shoot the varmints instead of trapping... Everyone wants to crud up my Christmas fun! Christmas will be purely about the Birthday of Jesus, this year, and except for my crafty gifts, it's going to be so good to be mostly crud free! Remember... Francis Caldwell's column is up "around" the 15th of each month! Frankly, that wasn't my original intention, but it seems to be that way, so that it is. I will try harder to get it up on the 15th! I promise! It seems that everything I read is about losing your favorite pet, these days. I hope we turn to a brighter topic, soon. In Chapter Fifteen, we find Captain Caldwell talking about losing his favorite dog, Buddy, and how he gets too close to dogs and refuses to get another. I can relate! Especially after Kilchis goes. How on earth will I be able to put myself through this, again? But, somehow I always do. They say the best remedy for a broken heart is a new friend. Perhaps now that I have read Fred Archer's explanation of where these "friends" come from, I will understand why I always give in, and bring that new friend into my life. It's because the dog that you lost picked it out and sent it to you, to make you smile, again! Also, without people like us, there would be an awful lot of sad puppies and kittens around! They need us! They do! So, if you've been putting off getting another critter, listen to Fred. Listen to your heart! Next time you run into a pet that looks at you with those longing eyes, take it home. It's been picked out especially for you! Don't walk away! We wish you a Merry Christmas, and a Happy New Year! May I do that, yet? I don't care! I am! It just makes me smile. I'm in the mood for the Holidays! My hands are all crafty and died in different colors. I have glitter from head to toe! It MUST be Christmas! The river is fun to walk, but that's it. It's brown and cloudy and really full! It doesn't seem like the Kilchis! Here is the Kilchis! This area is what we call "The Bedroom Hole" Hope it doesn't come too close to the bedroom. It's on its way, actually. We have lost a lot of bank, this year. Kilchis is so funny. He walks around digging for dead salmon. Once he finds one, he uses his paws to roll it up to the shore so he can roll in it. ICK! Both dogs have learned the word "Acky!" When we say that, they leave the salmon alone. I'm going to go get my Holiday decorations from the storage, today and have more fun, decorating. I miss fishing. But, there is just no way to fish when the water is so high. Maybe today the river will settle? I hope! The river is in good color, but is way too high for my liking. Some like it high, but... this high? Don't think so! I'll go take a video, if you like. I like taking videos as long as you don't mind silly singing! Singing is a must by the river! I'm still busy crafting. When I'm not, I'm on ifish or walking on the river, to get some fresh air and move around a bit. There are more and more salmon collecting on the river bank, but not very many. Bill went fishing with Dudley today. I was too busy getting ready for the Christmas party, so I stayed home. As soon as they anchored, they put out and got one fish, and as soon as they rerigged, got another, and then no more, all day long. That's salmon fishing for ya! It's just not that great this year. I have very little interest in fishing this salmon season. It is more fun for me just to watch when the numbers are down so low. I get thrilled to no end by simply seeing them swim by me, on my walks. Salmon are magnificent creatures! Don't get me wrong! I have nothing against people fishing this year, and all the more power to you! Several guides and fishermen are having great years this year! If you want to catch a salmon, book a trip with one of the ifish guides and they'll probably pull their magic out of the hat for you! Steelhead fishing is what I'm excited about! There have been some pulled out of the Kilchis already, which means that the Wilson will be even better! The Kilchis is not planted. We only get wild and stray hatchery fish. It's still enough to keep me going, but it's even more fun to drive over to the Wilson and hike in somewhere. Enough for today's dreams. I'm off to cook some dinner for some hungry fishermen! I used to drive around town, helping older people learn how to use the internet. I liked that. I was able to visit with them and laugh. I brought them special cookies or cakes, sometimes. I had time to do that! I miss time. I really do. Sometimes people write me with really neat ideas and I'm forced to pass them off to someone else, because I don't have time. Sometimes people write me with heartwarming stories and I have to hurry and read them so that I can finish this or that. I get so many e mails. I just wish I had time to devote to each one of them! So many lovely thoughts, prayers, stories, ideas! My friends say, "Jennie, you have to learn to say no." Well, I can say no, but it doesn't feel good. I wonder if I'll ever get used to that. It doesn't seem right or good. I have tried to make presents the last couple days for my friends but it seems like the phone rings too much, or my body won't keep up with what I want to do. I have to get up every half hour it seems, and check on ifish because some folks want to argue that "PFM" means "Pure freaking magic" and the mods are the ones with the dirty minds. Or, someone wants to bring up some controversial topic that will never be resolved on ifish. I guess ifish is a discussion board, but I never thought we'd be discussing global warming or if pot should be legalized or if abortion should be outlawed. I somehow thought this was going to be a fishing board. We'd discuss fishing. Is that so odd? Then, it became a hunting board, and then we had to start discussing gun rights, and ... well? ARGH! You know? Just ARGH! I wasn't prepared for this. It's taken on a community, a life of its own. It's taken time away my time. I love ifish. I love it because those people that I wanted to come help learn the internet? Those same people are intermingled in with the ones who want to argue. But, now there are so many that I can't tell who is who, anymore! And, some people are those same people I do like to visit with! Sometimes those nice people are just having a bad day and they get heated up about something that hits hard, and they say something they wouldn't otherwise. Then, I have to take time to tell them it's not OK, and I'm so afraid of offending them, but I have to be fair to all. Frustrating. Yesterday I woke up to the news that my Dad was awaiting emergency surgery in Desert Hospital in Palm Springs. It's been a roller coaster. I was so worried! So worried! But, then, I was shopping and my sister called and my Dad was fine! Had two stents put in and he was talking about working at the golf course on ThanksGiving! Oh, my! Happy Turkey Day! Life was good! I bought a wonderful dinner in celebration and cooked ham, fruit salad, scalloped potatoes! Yay! And then tonight, I got another call. My Dad is back in the hospital. Now, with Pneumonia. I've been set into panic mode, again. I want to fly to see him, but I can't, till after the Christmas party. Plus, it's so expensive this weekend. I just can't go. But... see? There it is again. TIME. We never know when it is going to be anyone's TIME. I am so lucky to have any time at all, after what I've been through. It is a miracle that I am alive to be blessed with time. I want to give my time to my Dad, before it is too late and we don't have any time at all. I miss those days when I'd sit and talk to people and teach them how to use the internet, and we'd laugh, and eat snacks together and talk about everything, but nothing at all. I want that kind of time with my Dad. I hope with all of my heart, that all those people on the discussion board that want to argue about things that will never get resolved here... well, I hope they have spent their time with their loved ones, and aren't wasting their time on ifish. Time is oh so precious. Don't waste one second! Especially with those you love! I was in a panic, thinking for sure we'd been messed with! I was clicking madly trying to figure it out! Who in the heck has a moniker of "No fences?!" I don't remember any stinkin' "No fences" member with 4k posts! Who is he/she? :LOL... These are the things that haunt me at night, when I'm laying in bed, and this morning, it happened! We'd been hacked for sure! Well, no! I was wrong! "No fences" is a moderator on ifish who changed his name from one thing to this! He is now, "No fences!" LOL. I have to laugh, now, but then? I was so panicked I thought I'd be sick! I probably even knew about it, and forgot. I probably read that someone was changing their name and didn't take note, who. But, man! For a while there, I thought for sure I was in big trouble! What a weekend it was! I drove with the boys and Bill to Lake Oswego to have turkey with my family. My Dad is still in the hospital, and I can't help but think about him all the time. Please say a prayer for him! I want to go to Palm Springs to be with him. I think I might, after the party. Things just are in a rush, lately! Crazy! So, every year the girls in our family stay downtown to do the Holiday thing. It's tradition, and by golly, even if I don't have daughters to accompany me, I go, anyway. I'm a girl! I belong! My sisters all have daughters and so does my cousin, Evie. We have lunch, downtown on Friday at Pazzos. I wish I could tell you about the gifts I brought all the girls, but if I did, I'd give away what I made for my moderators. In fact, that's how I discovered our "hacker mod" on ifish! I was making sure I had enough gifts to go around for the moderators, and I saw that name "No fences" and thought, "Who is HE/SHE?" I can tell you, however, that on each "gift" I painted each of the 9 fruits of the spirit for my sisters and nieces. It worked out perfectly as there were 9 guests! How perfect is our Father? I had to laugh! I knew His hand was in this! As soon as Christmas is over, I will share what the gifts I made are. Until then, it's a secret! I have to laugh, though. I did this (the crafts for all) because I'm financially strapped this year, and because I thought it would be easier. Ha! None of the above worked out! It's expensive to make crafts and it takes FOREVER!!! The thing that I love though, is that I had fun doing it and it means so much more to me! It is totally worth it! I hope hope hope people like them! (Have I given away too many hints?) Yikes! My trip to Portland was kind of interesting, though. I wasn't able to stay right downtown, so I wasn't really in the thick of things. It was a long walk to get to my sisters, so I was mostly alone. That wasn't so much fun. Plus, I was awfully tired, and every time I tried to walk, I got chest pains. I don't know if that is from the cold, or if something is wrong with me. I guess I'll find out, as my CT scan is coming up this next month. I hope I'm OK! I keep realizing over and over what a miracle it is, to be alive! I can't wait till I do most of my errands, today. It's a beautiful day. The sun is shining and the sky is a dusty light blue. The river is down, and I can't wait to go up to the riffles and see the salmon spawning! They've missed me! Look for a new "walk on the Kilchis" video on youtube! All of nature declares the glory of God by reflecting his beauty, wisdom, and power! Stan's column is up! I always get excited when I get to post his columns. Read it! It's awesome! How in the world did I get to know Stan? What a privilege! I'm pickled tink about that! I did my Kilchis walk, yesterday and filmed it. I'm kind of enjoying looking back over these short clips. It's what I do and it's fun to share it with my friends. Life has been SO hectic, lately! It's time, today for housecleaning. The mod board is just buzzing and again, we find out why. People who aren't who they say that they are pretending again. Argh. I hope that they remember that "Before you embark on a journey of revenge, dig two graves." It's just not healthy for anyone. I have so so so much to do to get ready for the party tomorrow, so off I go! Christmas is coming! Bring peace! Be a shining example! Someday I'll share with you a more recent stats page, but thought this was interesting. Wow! Ifish rocks!